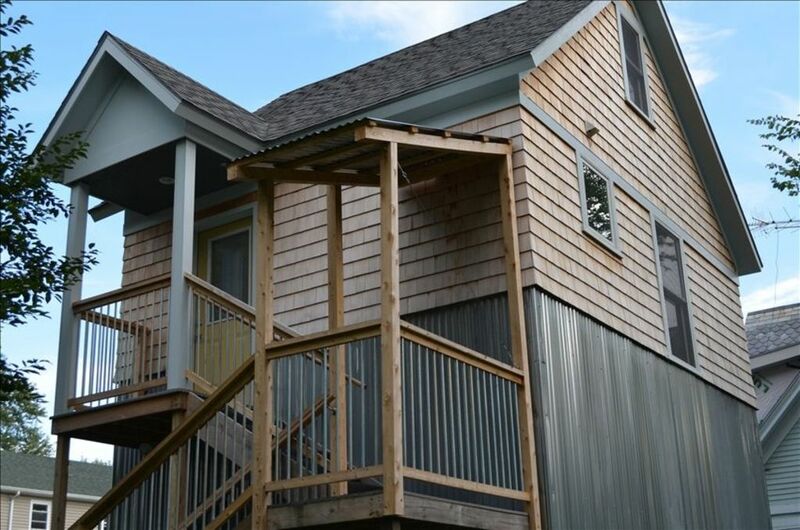 Welcome to our newly constructed studio apartment located above the detached garage in our back garden at 96 Ferguson Ave in Burlington Vermont. Affectionately known as the garage-mahal the apartment offers privacy and convenience. You'll enjoy the tree-top views and stylish space. In just 320 square feet there's a full kitchen, bath with shower, queen sized bed, dining table for two, loveseat, flat screen tv with WiFi connection and a ceiling fan. Garage-mahal is on the second floor and is accessed by outdoor stairs. We've lived in Burlington for nearly 20 years. We love Lake Champlain for sailing and swimming and the nearby mountains for skiing all winter. Quiet space and had everything you could want for a relaxing weekend. Short walk to downtown. Would definitely go again. It was really easy and clean and nice. Super easy. Just went there and had a nice time. Great property. Has everything stated in the summary. We will stay here again. Very good hospitality from the hosts and service. The location is very well situated near many local brew pubs, groceries, restaurants and from the city's core. Whie the location is well situated in the city it is also located in a very quiet residential area. We highly recommended this location if you want to visit Burlington. Warm, comfortable lodging - close to everything. This second story renovated garage dwelling provided a great base of operations for our Vermont vacation. It was warm, clean and comfortable. We arrived after dark so the building which is located behind the main house was obscured from the road. The owner was quick to help guide us to the property. We cooked in the kitchen one morning and was happy to find all the gear to prepare a breakfast. My wife and I would stay again. Nice hosts, quiet location, well kept "cottage" over a garage. It's a nice retreat, but a bit compact for two people. I wish the driveway access and outside lighting were better, but overall, a good place to stay. Rates are negotiable in the off season. Just sent and an email to discuss. For larger payments I will usually break up the payment in to a minimal reservation deposit and 2 payments closer to your arrival.